The first piece I ever had published in my career was an Amnesty International poster that I produced in a silkscreen poster workshop during my graduate school days at Tyler School of Art. The silkscreen poster workshop was led by one of my mentors, my undergraduate Professor, Lanny Sommese. 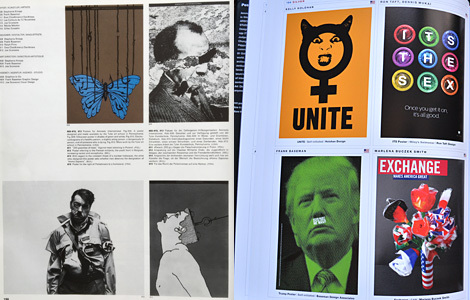 As an undergrad student at Penn State I had watched Lanny roll up some of his posters, stuff them in a mailing tube and ship them to Graphis Posters in Zurich, Switzerland, only to (sometimes) see the work published months later in a hard-bound book. And so, I too, took a shot at it long ago; and, lo and behold, my project was selected and reproduced in the venerable pages of Graphis Posters 1983! (page left; image upper right corner. A poster by one of my other mentors, my graduate school advisor Joe Scorsone, is directly below mine; and another colleague from those long-ago Tyler days, Stephanie Knopp, is to the left of mine). Some 35 years later, it never gets old: that thrill of seeing something that you worked so hard on, possibly slaved over; something that you yourself made—eventually published. And not just anywhere—but in Graphis, the mecca of all things international graphic design. The pinnacle. When one dares to put work out there to be evaluated, judged by a jury of your peers, people that work in your industry, and understand the work that you do—it’s a certain validation that all the time and energy spent on a project is worth it in the end. We are—as ever—deeply humbled and honored that the Rebus Sign Series and the Trump poster both won Silver medals in Graphis Posters 2018. It never gets old (page right; image lower left corner. Above mine, that of another Tyler colleague Kelly Holohan).